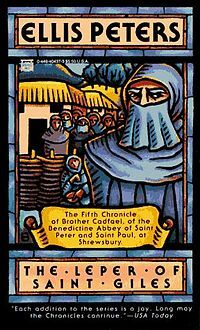 After a Cadfael outing I found rather lacklustre in Saint Peter's Fair, I'm pleased to report that I was back on happy footing with The Leper of Saint Giles. I read this book extremely quickly -- starting it one night and reading it halfway through, then finishing the next day -- which is certainly one way to read with a baby in the house. The other way seems to take weeks. I am not finding much room in between. This is the fifth book in the Chronicles, and once again we have a romantic relationship at the heart of the story -- this one a forbidden, between a bride-to-be utterly beaten down by her draconian guardians and the squire of the groomsman. There is murder done, of course, but the pace in this book is very measured and we spend more time pottering around the countryside and learning about herbs and leprosy in the first bit of the book than investigating any crimes. This is fine by me; it's all very interesting, and I like spending time with Cadfael no matter how he's spending it. A little under halfway through, there is a murder -- don't read the blurbs on this book if you don't want to know who gets it in advance -- and then Cadfael, at his own pace, investigates and sees justice done. I liked this novel not necessarily just for the investigation (which is great, if a little predictable again; at least Cadfael does a far better job of being an active sleuth and observer than in his last outing) but also for the other aspects -- the gentle ruminations on religion and human nature, the vivid supporting characters, and the wonderful setting. Once again, Peters has -- historically accurate or not, though the little reading I've done on this suggests to me that it's more accurate than not -- made life in the Middle Ages accessible and real to the reader, not just a listing of dates and grand names. It's the pacing that I like so much; it's not all deadly danger or dashing battles or unrest. These things are happening or have happened, but as is true today, life continues with its comforts and challenges; people get on. Of course, this being a mystery, sometimes people get offed, too. But it's not necessarily for some grand reason; it's more likely to be something incredibly petty than something on which rides the fate of nations. In The Leper of Saint Giles, unsurprisingly we learn about those unfortunates who have contracted leprosy or various diseases that look quite like it, and who are legislated away from all contact with healthy people. We learn about how they were treated, some of how they were viewed, and the way they lived. Or at least the way they lived in leper hospices, tended in this case by monks from the nearby abbey. Cadfael, once again, shows himself to be both practical and compassionate towards the unfortunate around him. I enjoyed the secondary characters this time around as much as ever: unflappable Abbot Radulfus, odious Prior Robert (who isn't given too much leeway to be too odious here), gentle Brother Mark who has taken over care of the leper hospital, having graduated from his position as Brother Cadfael's assistant, and we missed a few -- Hugh is only mentioned in passing, to my chagrin, but I'm sure he'll be back. We're also introduced to Avice of Thornbury, a new sister at a nearby cloister, of whom I'm sure we'll be seeing more. I do so like this gradual ebb and flow of characters around Cadfael at the centre. It feels organic, and very real. Some characters appear and disappear in one book; others hang around and stay connected. Another win for Brother Cadfael. I need to remember that when I'm having trouble sticking with anything, there are a few authors I can go to for a good read, and Ellis Peters is definitely one of them. I also need to remember that it's okay to go to them, that I don't have to stick with a book I feel I should read at this point, over a book that I know I will be able to enjoy all the way through. I read the first one in this series years ago, but somehow never continued with it. Maybe I should go back and do that! I've been enjoying the Magdalene la Batarde medieval mysteries lately - have you read those? No, but they're on my list thanks to you! I think I will finish this series up first before starting that one (don't want to confuse my medieval mysteries, of course).